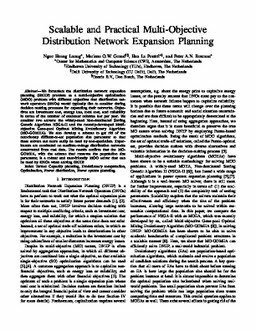 We formulate the distribution network expansion planning (DNEP) problem as a multi-objective optimization (MOO) problem with different objectives that distribution network operators (DNOs) would typically like to consider during decision making processes for expanding their networks. Objectives are investment cost, energy loss, total cost, and reliability in terms of the number of customer minutes lost per year. We consider two solvers: the widely-used Non-dominated Sorting Genetic Algorithm NSGA-II and the recently-developed Multi-objective Gene-pool Optimal Mixing Evolutionary Algorithm (MO-GOMEA). We also develop a scheme to get rid of the notoriously difficult-to-set population size parameter so that these solvers can more easily be used by non-specialists. Experiments are conducted on medium-voltage distribution networks constructed from real data. The results confirm that the MO-GOMEA, with the scheme that removes the population size parameter, is a robust and user-friendly MOO solver that can be used by DNOs when solving DNEP.